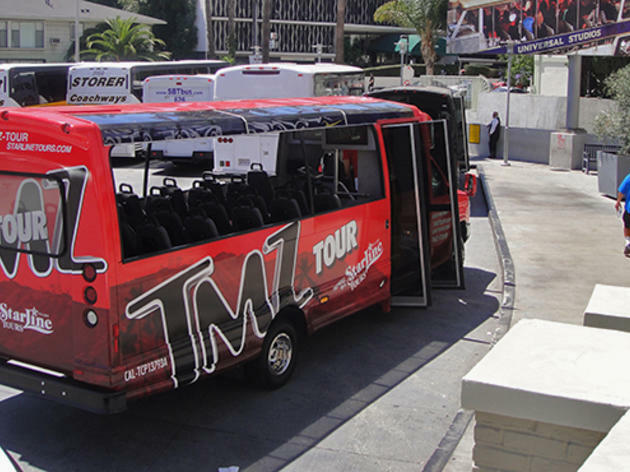 From the moment you’re escorted to the shaded, open-sided truck and its blaring music and crystal clear TMZ logo-emblazoned monitors, it’s apparent that the TMZ tour is a complete, high-production experience. As you cruise past other tours, you can’t help but feel like you’re on the cool bus. The tour guide ribs unsuspecting passersby and they taunt back—”Hey, it’s Brad Pitt!”—while also triggering an encyclopedic collection of location-relevant TMZ clips from Avril Lavigne to JFK. Much like the show and website, the tour ridicules celebrity culture as much as it enables it—behind every Britney Spears joke is the burning desire to spot her somewhere on the tour. Essentially, the experience provides three tours in one. The sightseeing aspect efficiently and lightheartedly covers the most notable stops in Hollywood, West Hollywood and Beverly Hills. Additionally, it’s a celebrity-hunting tour—the guides are armed with camera rigs to record fodder for TMZ—which leaves its success completely up to chance. And it’s an ode to founder Harvey Levin that veers into melodrama when recapping how the site broke the story of Michael Jackson’s death. 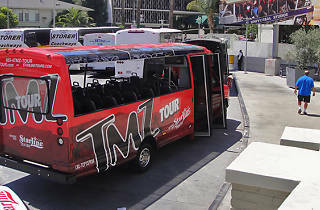 For those that haven’t bought into the TMZ universe, the tour is still a legitimately entertaining experience thanks to the easygoing tour guides and atonal, irreverent videos that toe the line of decency. Quite frankly, where else could you play a game called “Celebrity or Homeless Person?” as a homeless man stumbles alongside the bus with a bottle of booze?